DPWH Secretary Victor A. Domingo lauded the field engineers, rank-and-file employees, and officials of DPWH Region 6 for helping the government attain success in implementing development infrastructure projects in Western Visayas Region. The DPWH Secretary together with Undersecretary for Visayas operation Rafael C. Yabut, Presidential Management Staff (PMS) Undersecretary Ferdinand B. Cui Jr., and Assistant Secretary Emil K. Sadain recently visited Bacolod City and Iloilo City to monitor the progress of Bacolod-Silay Airport Access Road and Metro Iloilo Radial Road which are among the SONA infrastructure projects of the Arroyo administration. The 10.12 kilometer New Bacolod-Silay Airport Access Road Project provides smooth access to the new airport and will form a flexible road network. Also expected to reduce traffic congestion at the Iloilo-Roxas Road particularly the sections of Iloilo City and Leganes/Zarraga town proper is the 11.865 kilometers Metro Iloilo Radial Road. Domingo noted the significant improvement of travel time to the New Iloilo International Airport in Cabatuan with the widening of Iloilo-Sta. Barbara Road, also part of the President’s SONA projects. DPWH Region 6 Director Rolando M. Asis also reported to Secretary Domingo that aside from paying attention to SONA Projects, they exerted utmost effort in restoring typhoon “Frank” damaged infrastructure that wrought havoc in Western Visayas in June 2008. DPWH Region 6 massive rehabilitation efforts on damaged infrastructure facilitated the immediate restoration of collapsed bridges including rehabilitation of road cuts. With the Strong Republic Nautical Highway also among the priority projects of the government, DPWH Region 6 together with District Engineering Offices also undertook the improvement of road network leading to major ports so that products can easily be transported. Secretary Domingo said that through sound management of DPWH Region 6 under Director Asis, people in the Panay Island and Negros are enjoying the fruits of peoples’ hardship with better roads and bridges that speed up mobility of products and services as well as comfortable travel to major tourism hubs of the Region such as Boracay Island. DPWH Aklan District Engineering Office under District Engineer Robert Cabigas is continuously pursuing the improvement/construction of Boracay Circumferential Road to facilitate travel to various places in the scenic island. ILOILO CITY – President Gloria Macapagal-Arroyo will visit this city tomorrow to inspect the second flyover project here, which is being built under the President’s Bridge Program and Mega Bridges for Urban and Rural Development Project. The President will be briefed by Public Works Secretary Victor Domingo on the project and its positive impact on the livelihood and economic activities in the area. Construction of the new flyover at the junction of General Luna and Jalandoni streets started Dec. 22, last year. It is expected to be completed in June this year. Once it becomes operational, the flyover is expected to put an end to traffic congestion within the city and adjoining areas. The first flyover in the city was built two years ago at the junction of Infante and General Luna streets. Iloilo City Mayor Jerry P. Treñas said he is proposing another flyover, this time at the intersection of Barangay Taft North in Mandurriao district. He said the third flyover will relieve the flow of vehicular traffic in Jaro and Mandurriao districts, as well as the Diversion Road area. 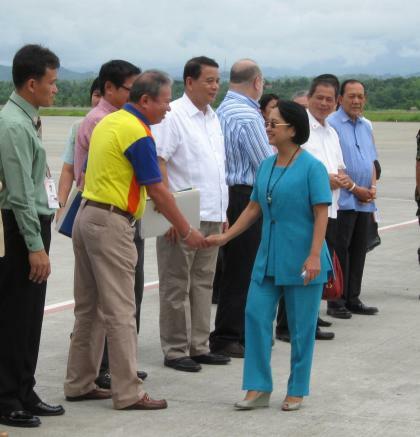 The area serves as access route to the new Iloilo airport in Cabatuan and Sta. Barbara towns. Iloilo City (25 September) -- DPWH 6 Director Rolando Asis said that the Department of Public Works and Highways is closely monitoring the completion of the 1.7 kilometer-road from crossing Irigasyon Sta. Barbara to boundary of Cabatuan, Iloilo, to avoid delays in its construction. Director Asis, in line with President Gloria Macapagal-Arroyo's visit in Iloilo, has instructed "our district engineer to address the welfare of the commuters in the said area who are currently experiencing discomfort in the on-going construction of the road". Asis said the P23.6 million infrastructure project is expected to be completed October 17, but due to inclement weather, "the completion schedule might be extended up to November this year". President Arroyo visited Iloilo September 24 to open the 15,000th Botika ng Bayan in Barangay Tiring, Cabatuan, Iloilo where she passed by the said road. Iloilo City (27 July) -- City Mayor Jerry Trenas disclosed in an NBN Televison that Iloilo is a beneficiary of several infrastructure projects under the administration of President Arroyo. This was his reaction following the 9th State of Nation Address of President Arroyo on July 27, where he mentioned the Iloilo Airport of Iloilo of International Standard, various road networks, and the flood control projects which is soon to be completed. According to Presidential Assistant for Western Visayas Raul Banias, among the projects in Western Visayas under SONA commitment are Iloilo Airport, the Kabankalan Airport and Bacolod-Silay airport access road in Negros Occidental, Kalibo and Catiklan Airports in Aklan, Iloilo Flood Control Project and access roads to Caticlan. 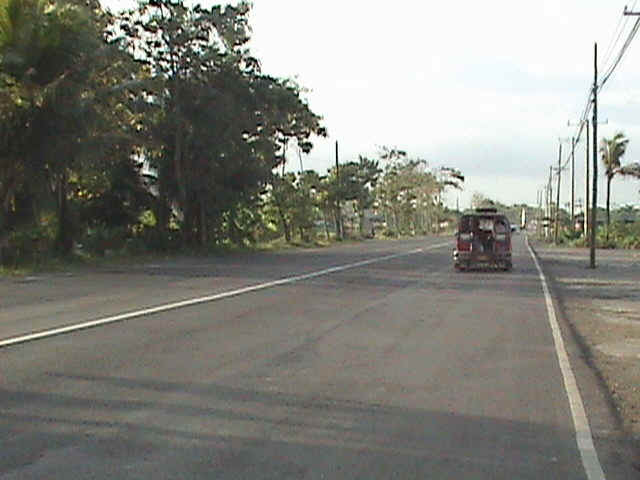 The DPWH in Region 6 disclosed earlier that the road widening project from Iloilo City to the new Iloilo Airport in Cabatuan-Sta.Barbara; Metro Iloilo Radial Road and the Pandan-Libertad Road ending up to the boundary of Antique and Aklan Province will be completed at the end of the year 2009. Director Rolando Asis on the other hand said that the SONA projects would not only improve accessibility to major tourist areas in the region but will also improve the region's socio-economic condition, for it will open employment and investment opportunities. Meanwhile, Senator Edgardo Angara for her part said that what President Arroyo has declared in her SONA was remarkable. He said during the interview in the same TV network, that under her administration "nag-expand talaga and ekonomiya, nakalikha ng maraming trabaho, at ang infrastructure na-tripple". He mentioned the benefits the nautical highway has contributed to the Filipinos where anybody can go to the south and bring their family and even their family car. Road widening project of the Department of Public Works and Highways has significantly reduced travel time to the new Iloilo airport. The 13.096-kilometer road widening project of DPWH Region 6 along the Iloilo City-Sta. Barbara Road, the main access leading to the new Iloilo International Airport located in the municipalities of Sta. Barbara and Cabatuan has addressed traffic congestion in the area. Considering that the project is among the SONA priority projects of President Gloria Macapagal Arroyo, DPWH Region 6 Director Rolando Asis said that the DPWH in coordination with the concerned contractor worked 24/7, barring unforeseen events particularly unfavorable weather condition. In his report to Secretary Hermogenes E. EBdane Jr. and Undersecretary Rafael C. Yabut, in-charge of Visayas operation, Asis said that they are confident to complete or substantially complete the road widening project before end of 2009. Mayor Arcadio H. Gorriceta of Pavia, Iloilo said that that the on-going road widening from the City of Iloilo to the airport passing Pavia road section of around 5.6 kilometers has cut travel time from the City of Iloilo to the airport. Mayor Gorriceta said that the present travel time from Iloilo City of about 35 to 45 minutes could be reduced to 15 to 20 minutes once the four lane road project is fully completed. “It will be traffic free already by that time. This will spark the economic development of Pavia, with the road network and I am very optimistic that once completed, Pavia will progress maybe twice or three times what we are experiencing in previous years” said Mayor Gorriceta . “I am happy with this project being undertaken by the DPWH, I am very grateful to the President Gloria Macapagal Arroyo for implementing this project in our locality”, added Mayor Gorriceta. Mr. Alfredo Gumaqui, former Sangguniang Bayan member of Pavia, Iloilo said passenger drivers have benefited due to lesser traffic resulting to increased income. Also, Rowena Gabalonzo, an employee of West Visayas State University-Calinog Campus and residing at Jaro, Iloilo City said that the road improvement lessened the travel time to and from her residence to work. Gabalonzo hopes that President Gloria Macapagal Arroyo will continue to support the DPWH which has managed improvement projects in Iloilo with great soundness. Iloilo City (27 February) -- The Department of Public Works and Highways in Western Visayas (DPWH 6) said that all SONA and other high impact infrastructure projects in support of tourism will be completed before the end of year 2009, or on the first quarter of 2010. Director Rolando Asis of the DPWH 6 said during the PIA interview that the transport sector is an important component of the economy impacting on development and the welfare of populations. He said that these high impact project declared by President Arroyo during her SONA are road widening project from Iloilo City to the new Iloilo Airport in Cabatuan-Sta.Barbara; Metro Iloilo Radial Road and the Pandan-Libertad Road ending up to the boundary of Antique and Aklan Province. "These three road network projects would not only improve accessibility to major tourist areas in the region but will also improve the region's socio-economic condition, for it will open employment and investment opportunities," Director Asis said. When asked of the specifics of the construction of the said projects, Director Asis explained that the road widening project from Iloilo City to the new Iloilo Airport involves widening of the existing two lane-road to four lanes; the construction of Metro Iloilo Radial road is on going, and about 12 kilometers from Barangay Lanit, Zarraga, passing thru the Iloilo Flood Control project to Sta. Barbara. About 27 kilometers of roads will be concreted from Pandan to Libertad ending up to the boundary of Antique and Aklan province is also on-going. Iloilo City (7 February) -- Three quality infrastructure projects in Western Visayas are on track to be completed on schedule or before year 2010. This was assured by Director Rolando Asis of the Department of Public Works and Highways, Region 6 in his report to DPWH Secretary Hermogenes E. Ebdane, Jr., noting that the projects when completed will boost the tourism industry of Western Visayas. The three high impact projects are: the P548 Million-worth road widening project from Iloilo City to the new Iloilo Airport in Cabatuan; P676 Million Metro Iloilo Radial Road and the P453 Million Pandan-Libertad Road ending up to the boundary of Antique and Aklan Province. Meanwhile, President Gloria Macapagal-Arroyo said that "to keep our economy resilient to major economic disruptions, we have ordered a surge in infrastructure spending- P200 billion from the national government, government corporations and local governments; three thousand kilometers of roads and 10,000 school buildings- these are firewall against the world volatility and as springboard for further growth". The main access leading to the new international airport in Iloilo has been vastly improved by the Department of Public Works and Highways. DPWH has undertaken the rehabilitation including widening of the Pavia-Sta. 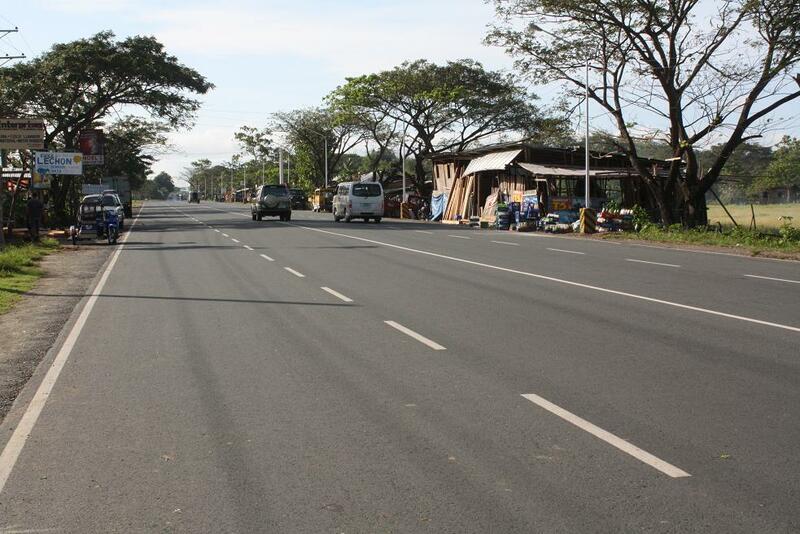 Barbara-Iloilo Road as part of the State of the Nation Address (SONA) commitment of President Gloria Macapagal Arroyo. According to DPWH Region 6 Director Rolando Asis, improvement of the Iloilo-Sta. Barbara Road is deemed necessary following the transfer and opening of airport at the municipality of Sta. Barbara and Cabatuan. Started March 2007, the improvement of Pavia-Sta. Barbara Section at a cost of P44.255 million involves widening of 3.895 kilometers existing asphalt concrete by 3.05 wide with 1.50 meters shoulder on both sides. The project for the road section which was completed early this year also covers the installation of reinforced concrete pipe culvert, grouted rip rap and slope protection, thermoplastic pavement markings, and repair of deteriorated asphalt. Additional improvement works at the Pavia-Sta. Barbara Section was undertaken at a cost of P21.086 million involving the widening of 230 lineal meter existing asphalt concrete road which is also completed. Bituminous tack coast and .05 meter thick 2nd layer bituminous concrete surface and hot laid were done at this section. Shojie Pacheco, a security guard from Sta. Barbara said that the improvement of roads in their area significantly contributed to the development of their towns in terms of increased mobility. Leo Castro Verde, driver of Shine Star Trucking based in Iloilo expressed his appreciation to the effort of President Gloria Macapagal Arroyo and the DPWH in improving highways in Iloilo as it facilitate easier land travel. Presently on-going although progress of work has been hampered by problems with road right-of-way and presence of utility lines is the improvement of 2.74 kilometer Iloilo City-Sta. Barbara Road that has a total cost of P27.887 million.